Last February 15, at 9:20 in the morning, residents of Chelyabinsk, Russia, looked out their windows and saw a giant ball of fire fly through the sky. The Chelyabinsk meteor was a 65-foot hunk of space rock that entered the Earth's atmosphere at about 12 miles per second before exploding with a force equal to 600,000 tons of TNT, enough to level buildings and send 1,200 people to local hospitals. The scary thing is: No one saw it coming, says the author of a paper, out today in the journal Science by researchers who studied the Chelyabinsk event. "Chelyabinsk was not detected in space at all," said Peter Jenniskens, an astronomer with NASA Ames and the SETI Insitute. "It couldn't be detected because it was coming from the direction of the sun." Over at Slate, the Bad Astronomer explains what the Science paper, as well as another Chelyabinsk paper published in Nature, say about the meteor's trajectory and what it was made of. Chelyabinsk-sized Asteroid Impacts May Happen More Often Than Previously ThoughtThey found that if you were 100 km (62 miles) from the Chelyabinsk impact, at peak brightness — and this stuns me — the asteroid was 30 times brighter than the Sun! I haven’t heard any anecdotes about this specifically, but the thermal pulse, the flash of heat, must have been palpable, even from that distance. Incredible. Who's keeping an eye on these "near-Earth objects" as they're called, and devising plans to keep us from going the way of the dinosaurs? 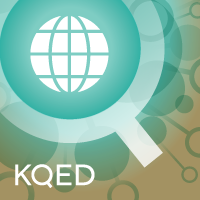 KQED Science's video team looked into it. Meanwhile, the United Nations General Assembly is mulling a plan for the world's space agencies to defend the Earth against asteroids, reports NPR. Space Agencies Of The World, Unite: The U.N.'s Asteroid Defense PlanScience The United Nations General Assembly may approve a plan soon for the world's space agencies to defend the Earth against asteroids. The plan, introduced last week, is expected to be adopted by the General Assembly in December.